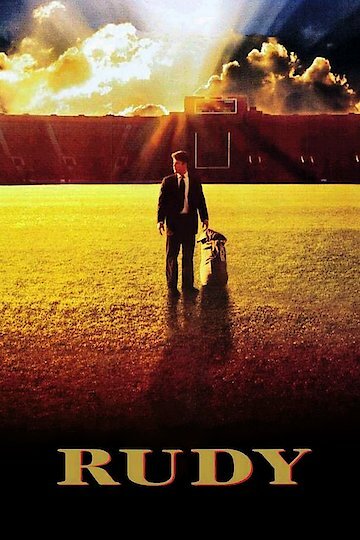 Rudy is a sports-filled dramatic film that was released in 1993. It is based on the life of Daniel “Rudy” Ruettiger and it is a true story. Rudy was a young man who grew up idolizing the University of Notre Dame and their football squad. He dreams of one day attending the University and playing for their football team. All of the odds are against Rudy however. His family is poor and his grades are not good enough to get a scholarship so it is highly unlikely that he will be admitted to the school. He is also extremely small and not a good football player so even if he gets into Notre Dame, odds are he will not make the football team. No one in Rudy’s family encourages his dreams and they all believe he is better off working at the steel mill in town. One day, Rudy’s friend is killed in an explosion at the mill and Rudy realizes that he has to recommit to his dream to getting into Notre Dame. Rudy gets into a junior college across the street from Notre Dame and works hard hoping to get good enough grades to transfer into the school. He begins working for Notre Dame as well and meets a graduate student who agrees to tutor Rudy. Rudy is currently available to watch and stream, buy on demand at Amazon, Vudu, FandangoNow, iTunes, YouTube VOD online.